Thirty players made appearances for manager Greg Yelverton’s side across the year, including DCU’s Ross Taheny, Gavin Kearney, and Alan O’Sullivan. FAI Chief Executive John Delaney was present to give over the caps to the new internationals, who played a number of high-profile fixtures across the past season – including travelling to the World University Games in Chinese Taipei. 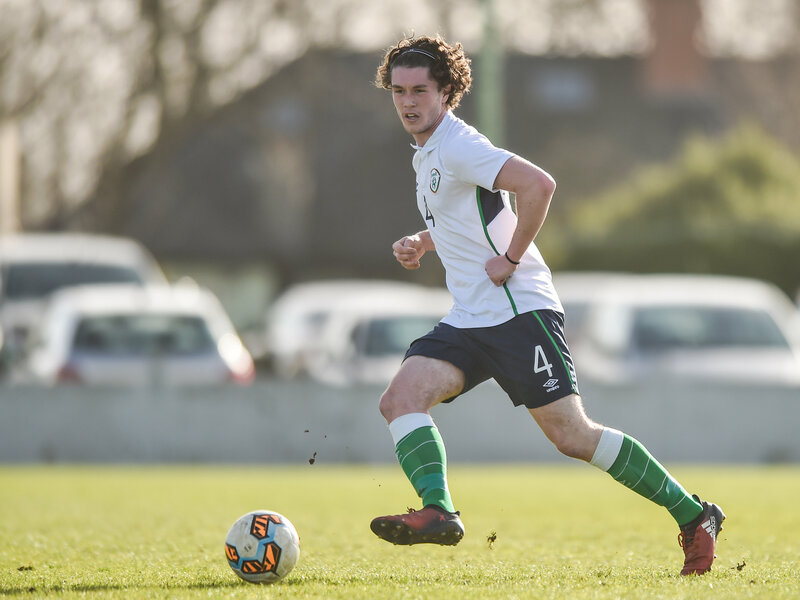 Recognition of university football on the national stage began back in 2016, when Paul Rooney was awarded the first-ever Colleges and Universities Player of the Year, and DCU defender Kearney is extremely proud of the side for finally getting the recognition from the governing body. “It’s a great honour to receive the cap from the FAI,” Kearney said. Fellow cap receiver Taheny, who represented Ireland at this past summer’s University Games, echoed Kearney’s feelings. “It was a massive honour to represent Ireland and I’m delighted to receive a cap to mark it,” he said. “It’s another step in the right direction for third level football in this country. “The CUFL have taken very positive steps in recent years and it offers young footballers in this country a brilliant pathway to further their careers. The Colleges and Universities sides represented a selection of the best players from the Third Level institutions across the country, and sees a lot of representation from sides in the League of Ireland and the Leinster and Munster Senior Leagues. “The CUFL has grown from strength to strength in its twelve seasons of existence,” commented an FAI statement. “The league currently contains eighty-one teams across five tiers of men’s football along with the twenty-eight women’s teams competing across two divisions in the competition. “In 2015, following decades of competing as national representative sides as Colleges and Universities individually, both affiliates agreed, in conjunction with the FAI, upon forming a combined international team to compete at international level. The standard of the college game is improving year-on-year, and the Men’s side at the Games brought home the pride of an impressive draw against France in their opening game. They also defeated tournament hosts Chinese Taipei, but defeats against Mexico and South Africa did leave the lads underachieving a little – despite the strides being taken. Perhaps best illustrated in DCU by the college’s ability to attract former League of Ireland-winning player and manager Johnny McDonnell to the coaching staff for the senior side, and Kearney and Taheny have praised the massive jumps in standard in recent times. “With Johnny coming in with Declan really has had a huge impact on the team with his experience and the level he’s managed and coached at,” Kearney said. “College football has been very good to me”, Taheny added. “For the last two years I’ve been lucky enough to be involved with Greg and the CUFL national team and last year we had a decent campaign with DCU, getting to the semi final of both the league and the Collingwood Cup. Looking forward, both Kearney and Taheny have lofty ambitions to add to their caps, and aim to be travelling with the squad once more for the next World University Games in Italy in two years’ time. “The plan is to get the degree in the bag and push on in terms of football,” Taheny said. Kearney added: “Well I’m constantly working hard and really hope to be included in the international set up for the next two years as we build towards the Games in Naples in 2019.